Can You Stop the Pictish Hordes? War has come to the Westermarck. The primitive Picts, led by the powerful shaman Zogar Sag, are marching west to reclaim the land that was once theirs – aided by sorcery and a traitor from the Aquilonian ranks! Can the mighty Conan uncover the treachery and stop the savage attack? Recreate the excitement of the glorious Hyborian Age in this solo adventure for GURPS. 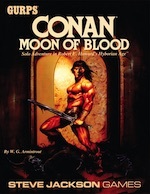 Based on the story "Moon of Blood," featuring Robert E. Howard's legendary barbarian, Conan of Cimmeria, it can be played many times without repeating the same game. Relive the exploits of the mighty Conan, or send a hero of your own design on the road to fame and glory. GURPS statistics for Conan at age 40. This is a sequel to Conan Beyond Thunder River. You can use the character from that adventure here, but it is not necessary. Become part of the Conan legend with Conan: Moon of Blood! GURPS Conan: Moon of Blood can be played as the conclusion of a two-part epic adventure begun in GURPS Conan Beyond Thunder River!